Nothing says “Welcome Home” like cookies and brownies baked from scratch. 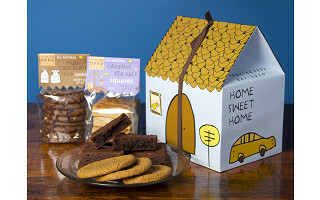 Dancing Deer is a Boston-area company well known throughout New England for its cookies, brownies, and cakes that are full of delicious homemade flavor. Founded in 1994 as a small local bakery in West Roxbury, MA by business strategist Suzanne Lombardi, baker Ayis Antoniou, and environmentally-conscious Trish Karter, it’s no coincidence that every bite tastes like it’s right from your grandmother’s kitchen; Suzanne’s own grandmother was the original source for many of the bakery’s recipes. In fact, Dancing Deer was named after Suzanne’s grandmother’s antique shop in Bar Harbor, ME. While Dancing Deer has outgrown its original corner shop location, it remains committed to maintaining the integrity of its recipes, as well as the quality and purity of its ingredients, sourcing as much as possible locally. In 2009, Dancing Deer became one of the first of 25 bakers in Boston to be certified as a sustainable business and has maintained that certification every year since. Dancing Deer products aren't just full of flavor, they're full of thought and care. At Dancing Deer Baking Company, we are passionate about food, nature, aesthetics and community. From our family to yours, we put the touch of home baked goodness into all of our delicious and all-natural brownies, cookies, cakes and specialty gifts. Great tasting goodies are our passion. We hope you enjoy! I have ordered from Dancing Deer for years ... and oh, I love them! A very personal company to talk with (funeral 'gifts' , a birthday I almost forgot about, power outages ... the list goes on and on!) Their offerings are delicious (love the Christmas ones ..!) and the presentation is better than anyone in the market. Their wooden boxes are beautiful (very Shaker!) and my whole family has towers of them ... and all in use. I love that nothing goes to waste. To friends far away, the Birthday Party in a Box is the next best thing to being there and baking the cake for them. I don't know how they make a profit ... their pricing feels below cost! But I will recommend them and use them and praise them until my last breath! @Lynn Hello Lynn, Thank you so much for your kind words. We work hard to keep our costs down and watch our overhead, while being able to provide the beautiful gifts to please many palates. If you have a family member or friend heading off to college, this housewarming box will put a smile on their face and will give them some instant friends!! What a great way to break the ice when meeting the new room mate! Which item is your favorite? Love, Love, Love Dancing Deer Baking Company. I have sent Dancing Deer all over the country. I have always been thrilled by how happy the recipient is. I first got Dancing Deer cookies in a holiday basket at work and enjoyed it so much, I sent a box to my father the same day. Super yummy and great customer service. The customer service rep I spoke with helped me select a gift that would travel well from Boston to California. Excellent product, excellent service. Keep it up!!! @Deborah Hi Deborah! Thank you SO MUCH for your kind words! It is always so mice to hear from a satisfied customer. Check out our fun Birthday Party in a Box gifts for your next family birthday and thanks again for choosing Dancing Deer! Gee, I invented "Birthday Party in a Box" about 3 years ago. I included a cake, candles, plates, napkins, party hats, party noisemakers,and goody bags. @Nancy Hi Nancy, I guess great minds think alike! Ours are great for those who don't have time to do it themselves, but you have some lucky friends and family to get all those homemade goodies. Thanks for your comment. Nothing says “Welcome Home” like cookies and brownies baked from scratch. 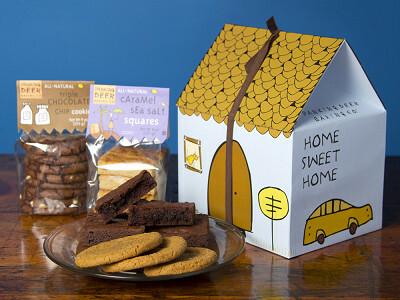 Dancing Deer is a Boston-area company well known throughout New England for its cookies, brownies, and cakes that are full of delicious homemade flavor. Founded in 1994 as a small local bakery in West Roxbury, MA by business strategist Suzanne Lombardi, baker Ayis Antoniou, and environmentally-conscious Trish Karter, it’s no coincidence that every bite tastes like it’s right from your grandmother’s kitchen; Suzanne’s own grandmother was the original source for many of the bakery’s recipes. In fact, Dancing Deer was named after Suzanne’s grandmother’s antique shop in Bar Harbor, ME.